I have a confession. Please don’t judge me too harshly. I didn’t brine this chicken. As you may know, I’m a big fan of the brine. I use it in my Perfect Roast Chicken recipe all of the time. However, I was feeling lazy. It happens to the best of us. Especially those of us who are naturally predisposed to an almost criminal level of laziness, like me. A brine, though ridiculously easy and ridiculously worth it, is something that needs to be started by at least mid-afternoon the day before serving a roast chicken. And I wanted to take a nap. So I thought … whatev, I’ll dry rub the hell out of that chicken after I get a couple hours of sweet, sweet afternoon shuteye. The chicken turned out quite well in spite of my laziness. The sumac worked beautifully with the chicken. In the future, I’m going to brine the chicken and use this rub or a variation on it. The butternut squash salad was also delicious. The squash had a lovely amount of crunch, but if you want it softer, increase the baking time. 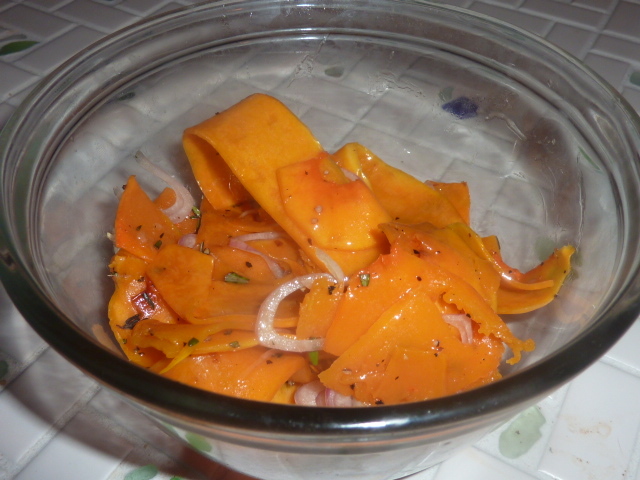 The vinegar lent a light pickle taste to the dish and the savory herbs balanced against the sweetness of the squash. It was a really light and lovely side dish. I think I’m going to prepare it for my next family Thanksgiving as a foil to all of the richer vegetable sides that end up on the buffet table. Mix together sumac, marjoram, parsley, garlic powder, kosher salt, and freshly cracked black pepper. Rub chicken on all sides and inside cavity with olive oil. Season liberally with sumac mixture. Stuff cavity with lemon, garlic, parsley, and shallot. Let sit, uncovered, on a baking dish on top a roasting rack overnight in refrigerator. Roast at 475° for 15 minutes or until skin is light golden brown. After 15 minutes, reduce heat to 350°. Roast chicken roughly 20 minutes per pound (rounding up to nearest pound), or until meat thermometer inserted into the thickest part of the chicken’s thigh reads 185º. If chicken becomes overly brown, tent with a piece of tinfoil. Using a mandolin or vegetable peeler, cut butternut squash into thin strips lengthwise. Place on 2-3 large baking sheets in a single layer. Add crushed garlic cloves. Season with sugar, salt, and freshly cracked black pepper. Let sit 20-30 minutes. Sprinkle the squash and garlic with olive oil and toss to coat. Place back in single layer. Place baking sheets in oven and bake 8-10 minutes until edges are light golden brown. Remove from oven and let cool. Transfer to a medium bowl. Add thinly sliced shallots and season with red wine vinegar, thyme, and rosemary. Taste for seasonings. Transfer to refrigerator and let chill 1-2 hours. I haven’t posted a roast chicken recipe in a few weeks, so I guess I’m overdue. We got this chicken from a local kosher butcher, and while the taste was fantastic, it had a TON of pinfeathers still in it I had to pull out and I probably won’t be buying a whole chicken from that particular butcher again. Keep in mind if you are buying chicken from a butcher (particularly a kosher butcher) that many pre-brine their chickens, as was the case here. Because of that, I skipped the wet brine and did not use any salt in my dry rub. The rub turned out fantastic, though – a perfect combination of slightly sweet and slightly spicy. As always, for a full how-to on roast chicken check out my post for the Perfect Roast Chicken (just be sure not to brine a pre-brined chicken, it will be over-salted and mushy). The sweet potato fries were also very good, with a hint of heat from the Old Bay and lots of sweetness from the fries themselves. The cool tang of the Greek yogurt-based dipping sauce worked really well with them (and the chicken). I only pictured the fries up top, but there is a picture of the whole meal after the jump. Combine all dry rub ingredients. Take Brummel & Brown from above and rub all over chicken, including under skin, in cavity, and on reverse side. Repeat with dry rub. Dress the chicken with lemons and apples by shoving deep into the cavity of the chicken. Allow chicken to rest, uncovered, on roasting rack in refrigerator for at least 6-8 hours, preferably overnight. Remove chicken from refrigerator and place on a baking dish on top of a roasting rack. `Place chicken in preheated oven on center rack. Roast at 475° for 15 minutes or until skin is light golden brown. After 15 minutes, reduce heat to 350°. Roast chicken roughly 20 minutes per pound (rounding up to nearest pound), or until meat thermometer inserted into the thickest part of the chicken’s thigh reads 185º. If chicken becomes overly brown, tent with a piece of tinfoil. As chicken is resting, increase heat to 450º. 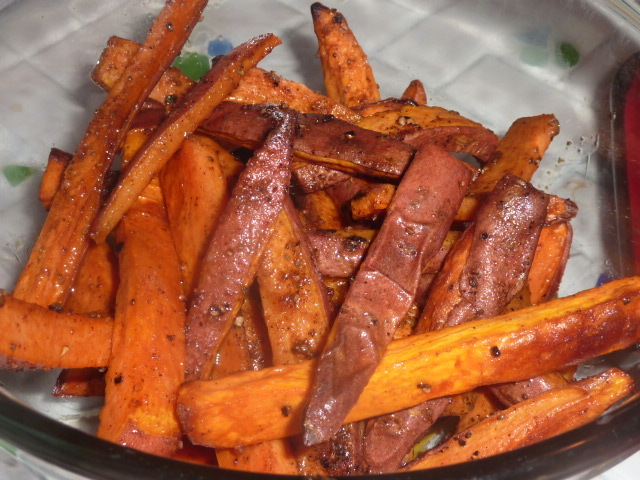 On a tinfoil lined baking sheet, toss sweet potato strips with olive oil. Season with Old Bay, kosher salt, and freshly cracked black pepper. Bake 20-25 minutes or until crispy on the outside, shaking pan every 5-10 minutes. Whisk all ingredients together and let chill in refrigerator at least one hour.